When I decided to become a writer, I mean really become a writer—drop everything else I was working on and hunker down to actually write my first novel, I didn’t stop to think about if people would want to read it. It sounds funny, but I was so excited about writing, that I hadn’t gotten to the thoughts of what happens after it’s written. When I finally typed “The End” on the first draft, reality came tumbling in, along with worried thoughts about if anyone would want to read my book. I’ve often said that handing your completed book to readers is like standing on a street corner naked—you don’t know if readers will throw tomatoes or whistle (I prefer the whistles). This statement, I’ve found, is true for every book I write. The worry doesn’t fade. 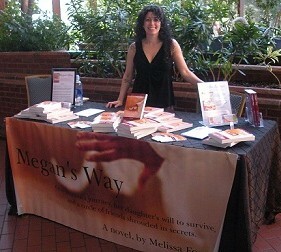 Imagine my surprise when MEGAN’S WAY was named Finalist in the 2010 Next Generation Indie Book Awards. That was quite an honor. I think I must have screamed for 23 hours straight (my family wore ear plugs). 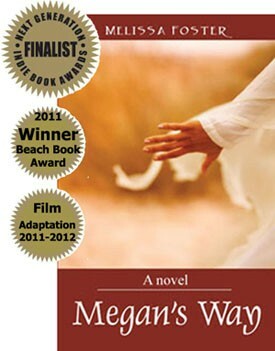 This year, MEGAN’S WAY won the 2011 Beach Book Festival Award, which brought tears of joy. The funny thing is, even though some of the worried thoughts have lessened, I still get butterflies when someone says they’re going to read my book. Now, with the film adaptation of MEGAN’S WAY on the horizon, you’d think my worries would fade completely. People like my book. Whew! My writing has been compared to Jodi Piccoult, which is a great honor, and to add another layer of happiness, my writing in CHASING AMANDA, my second novel, has been likened to Ted Dekker by a lovely reader. I couldn’t be happier with the compliments, and yet, there’s still that flitter of concern in my belly. Every book is not for every reader, and much like ice cream, we’re lucky they come in several different flavors, or genres. I’m thankful for all of the readers who appreciate my books. I’m approaching the film adaptation with joy and pushing aside my worries about what viewers will think. Those who enjoy the movie will gain entertainment, and hopefully enlightenment of the themes that are woven through the story of friendship, acceptance, and the bonds of secrecy. I have faith in my director, Wendy Crouse, and know the movie will be as wonderful as the book itself. For me, the honor of the awards and film adaptation are simply icing on the cake. I was thrilled when I received the first reader review, and am just as thrilled with every review I have received since. The excitement never ends (and neither do the butterflies). Megan’s illness reawakens the torment of her best friend, Holly Townsend, whose long-held secrets and years of betrayal come back to haunt her. How does one choose between a daughter and a life-long best friend? Can the secret she has been keeping be revealed after years of lying without destroying everyone in its wake? Megan’s Way is a journey of self discovery and heartfelt emotions, exploring the depth of the mother-daughter bond, and the intricacies of friendship. Megan steadied herself against the cold porcelain sink, hoping the morning’s nausea would subside and trying to strengthen herself for the tough decision that had been wreaking havoc with her mind lately, and the choice that lay ahead. The familiar Tink, pause, Tink, pause on her bedroom window drew her attention. A confused cardinal had repeatedly gone beak to glass in recent weeks, as though trying to rouse her. As she tried to calculate the number of times she’d also awakened to nausea, the familiar surge of bile rose in her throat. She clung to the toilet as if it were a security blanket. The smell of last night’s dinner still wafted in the air, sending her body into convulsions of dry heaves. Great, Megan thought as she grasped her stomach. She looked up at the ceiling, What the hell am I going to do now? “Mom?” Olivia’s voice carried down the hall. “Mo-om!” The single word stretched into two perfect teenage syllables. Megan heard the drama in her voice and closed her eyes against her growing frustration. She knew that particular scream, the self-centered, in-a-hurry, where’s-my-stuff scream. She did not have the patience to deal with Olivia’s drama on this particular morning. She grabbed hold of the sink and pulled herself up. Her stomach lurched again, causing her whole body to clench. She prayed for some relief as Olivia’s voice came screaming at her again. “What!” she snapped back. She wished she could have been more patient with Olivia, but at that moment, she was overtaken by exhaustion, confusion, and anger. She wanted to kick something, to cry, to scream until she no longer had a voice—but her body was too tired to do any of those things. She had to pull herself together and get through the day. Megan rinsed out her mouth and averted her eyes from the sheet-white face that reflected back at her. Melissa Foster is the author of two novels, Megan’s Way and Chasing Amanda. She is the founder of the Women’s Nest, a social and support community for women, and is currently collaborating with Director Wendy Crouse, Dream Real Pictures, in the film production of Megan’s Way. Melissa hosts an annual Aspiring Authors contest for children, she's written a column featured in Women Business Owners Magazine, and has painted and donated several murals to The Hospital for Sick Children in Washington, DC. Melissa is currently working on her next novel, and lives in Maryland with her family. Melissa's interests include her family, reading, writing, painting, friends, helping women see the positive side of life, and visiting Cape Cod.